Good. Sound copy that may show minimal signs of wear or previous ownership. The fall of Constantinople, 1453. I think this book is one of the best I've found not only to describe the issues of the conflict in 1453 of Christian and Islamic forces in, then, Constantinople, but also to put that information in perspective as it pertains to the conflicts that now present themselves in the world. 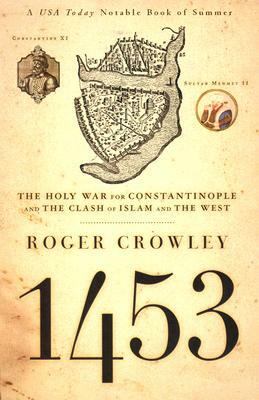 I STRONGLY RECOMMEND THE BOOK "1453" WRITTEN BY ROGER CROWLEY. THE AUTHOR PROVIDES DETAILED INFORMATION IN SUCH A MANNER , THAT YOU WILL THINK THAT YOU ARE IN CONSTANTINOPLE AWAITING THE OTTOMAN ATTACK. THE PREPARATIONS THAT THE BYZANTINES TOOK OVER THE CENTURIES WAS CLEARLY DESCRIBED. AND THEN AGAIN, THE DETAILED EVENTS THAT LED TO THE OTTOMAN ATTACK WERE CLEARLY DESCRIBED.